Create, test, and repair circuits safely and easily with photorealistic 3D components, solderless breadboard and get the shematics simultaneously. Explore the laws of electricity and electronics via multimedia screen with virtual measurements, sound and animation. Full range of analog and digital electronic components. 100+ experiments and problems perfectly combine fun with education. Tools to create your own courseware to match curriculum objectives. Fits science, physics and basic electronics curriculums. EDISON Version 5 provides a unique new environment for learning electricity and electronics. Teachers, students and electronics enthusiasts can use digitally scanned photorealistic components, a solderless breadboard, virtual instruments, sound and animation to create, test, and safely repair lifelike 3D circuits and simultaneously see the corresponding circuit schematic. EDISON also comes with over 100 experiments and problems that teachers and students can use immediately. Select lifelike batteries, resistors, diodes, LEDs, transistors, logic gates, flip-flops, and even integrated circuits-- all easily available on the shelves of your multimedia lab. Pick and drag components onto your worktable or plug them into the realistic virtual breadboard, where you can even see the hidden internal connections. Wire the parts together with the mouse and your circuit begins working immediately so you can test and troubleshoot it with virtual instruments. In addition, EDISON automatically prepares a standard schematic diagram and displays it simultaneously. 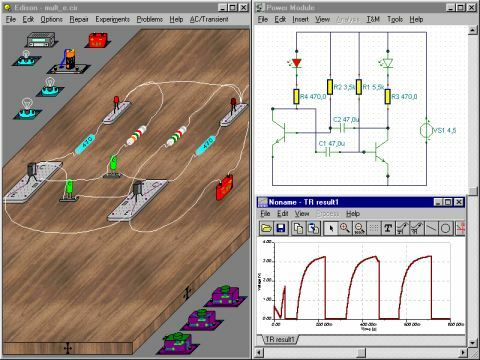 Once you have become familiar with schematic diagrams, you can use EDISON’s schematic editor and circuit analyzer, compatible with the more advanced TINA circuit analysis program. EDISON provides a state of the art analysis results window in addition to its virtual instruments. Using the results window, you can create diagrams with full control over axes, line style, color and fonts. You can print or save these diagrams and the 3D circuit in high resolution, or cut and paste them into your favorite word processor. Create, test, and repair circuits safely and easily with lifelike 3D components and get the shematics simultaneously. EDISON is the exciting new way to teach and learn about Electricity-Electronics. You can use the multimedia functions of EDISON to investigate and experiment on screen to find out how real circuits behave. Lifelike 3D components are connected using the mouse to form realistic networks. Bulbs burn more brightly and motors turn more quickly as the applied voltage is increased. You can see the bulb light and even hear the motor turn. Change the value of components to alter the scenario - resistor color codes change automatically! If the voltage is too high the bulb will blow! However all is not lost; use the repair facility to restore the damaged component and make the circuit work. Introduce meters to measure circuit parameters and discover and prove the laws of electricity. Design practical circuits and introduce faults so that problem solving techniques can be mastered. EDISON is suitable from age 8 to pre-university level. It provides a precise but fun environment in which students can discover the excitement of the Fabulous World of Electricity. EDISON 2.0 is available in one versions: AC and DC. DC version: Bulbs, Batteries, Resistors, Motors, variable Power Supplies, Variable Resistors, Switches, Voltmeters, Ammeters and Ohmmeters. Make your own circuits or select from 27 exciting electric experiments included in the program. See, read, hear, and experiment with a wide assortment of electrical scenarios. You can also practice troubleshooting or solve more than 100 problems provided or create your own. AC and DC version: Includes all DC components plus Oscilloscopes, Signal Analyzers, Variable Phase Sinewave Generators, Loudspeakers, AC-Multimeters, Inductors and Capacitors. Play with the new electrifying brain game included in the program. Combine strategy, tactic and luck to find your way in the exciting world of electricity. Play, win, troubleshoot, and then experiment again! As an added bonus, get an inside view of the real electronic circuit design.